Post-doctoral research associate Rakitha Beminiwattha appreciates the irony of the work he does at the Jefferson Lab. The Thomas Jefferson National Accelerator Facility, or Jefferson Lab, in Virginia houses the Continuous Electron Beam Accelerator Facility (CEBAF), a 1.4 kilometer-long, racetrack-shaped machine that propels electrons to nearly the speed of light before striking its target. 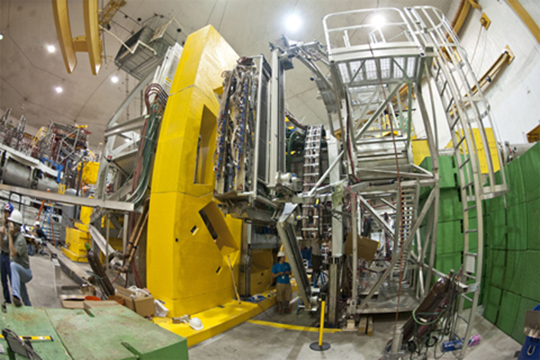 It is the world’s most advanced electron accelerator for studying the basic elements of the atom’s nucleus. Massive equipment, complex preparations, many collaborators and years of data and analysis searching for discoveries on the smallest of scales. Currently stationed at the Jefferson Lab, Beminiwattha has been working under Professor Paul Souder, in the Department of Physics, since May 2013, putting together various components of three research projects in particle physics. Beminiwattha has conducted research at the Jefferson Lab for several years as a research associate and as part of his studies at Ohio University, where he completed a Ph.D. in nuclear and particle physics last year. 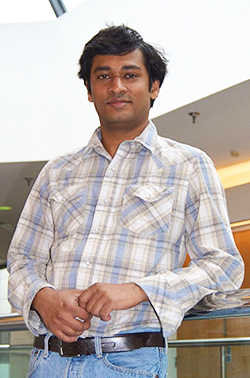 His thesis, involving data acquisition, software development and data analysis for a major physics experiment at the lab, was recently recognized by fellow scientists. 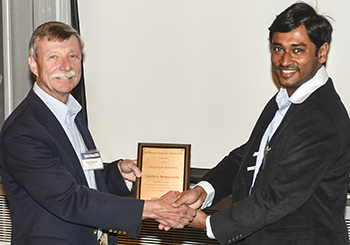 Beminiwattha was awarded the 2014 Jefferson Science Associates Thesis Prize during the lab’s Users Group Annual Meeting in June. Members of the users group are scientists from across the United States and from 30 countries who conduct research at the lab, which is operated by Jefferson Science Associates for the U.S. Department of Energy. His thesis, “First Determination of the Weak Charge of the Proton through Parity Violating Electron Scattering,” was based on his work on a large-installation experiment called Q-weak. “My data analysis work focused on the extraction of the physics asymmetry from part of the accumulated data and applies background and radiative corrections to obtain the 21 percent measurement of the weak charge of the proton,” Beminiwattha says. The research involved trying to better understand the structure of the proton using calculations predicted by the Standard Model. The Standard Model theory, which tries to explain how matter is formed, involves the basic particles of matter and three fundamental interacting forces: electromagnetic, weak and strong. The theory, however, doesn’t include the fourth fundamental force, gravity. “The ultimate goal is if we had one theory that explained everything that we see around us,” Beminiwattha says. Beminiwattha receiving the 2014 Jefferson Sciences Associates Thesis Prize. For the Q-weak experiment, an electron beam generated from the accelerator was sent to one of three separate experiment halls to a liquid hydrogen target. Scientists then measured the scattered electrons from protons in the target to extract information on the proton. Beminiwattha was involved in commissioning of the experiment and data taking and analysis. The experiment, which finished in 2012, was published in Physical Review Letters. His advisors encouraged him to submit his thesis. “Writing a thesis takes a long time and a lot of effort, so it’s really rewarding to receive the recognition for all the hard work you’ve done for the five to six years,” Beminiwattha says. The prize, awarded for the best Ph.D. student thesis on research related to Jefferson Lab science, includes a $2,500 cash award. At SU, Beminiwattha, who completed his undergraduate work at the University of Peradeniya in Peradeniya, Sri Lanka, is currently working on background radiation and shielding design for an upcoming experiment, the Lead Radius Experiment (“PREX”). “We are trying to measure the radius of the neutron using a lead target,” Beminiwattha says. The experiment had an initial run in 2010, but the researchers are seeking more precise measurements and are making improvements to the experiment, including working with engineers to design devices to shield radiation. He is also working the conceptual designs for two experiments planned to run in the upgraded Continuous Electron Beam Accelerator Facility. One set of experiments is based on the Solenoidal Large Intensity Device (SoLID) apparatus, which will provide a precision test on the Standard Model, using measurements from helium and proton targets. The research could open a new window to study Quantum Chromo Dynamics, a theory underlying how nuclei are formed from fundamental particles. “I’m trying to minimize the background contributions that could affect our final measurements for certain proposed experiments on the SoLID apparatus,” he says. Beminiwattha meets with Souder once a month and has weekly discussions on the ongoing preparations for the experiments.